Hostel Bakano was great. The staff were extra friendly and Luis was informative for things to do in the city and in the country for other parts of our trip. The location in La Candelaria was perfect, as everything is close by: museums, the hip Chorro de Quevedo plaza, restaurants and pubs, Transmelinio stops, and banks. A quiet place in a great location with the nicest staff. The staff here are so wonderful and kind, going out of their way to welcome us and give us great recommendations. The hostel is in a great location close to all the museums and a ton of bars. Would for sure come back! Only stayed one night but glad I did! Very relaxed atmosphere, so don’t come here to party or be loud. Perfect location in the middle of Candeleria, 2 min walk from where one of the graffiti tours begins. My shower was ice cold but private bed was comfy and quaint. Biggest recommendation is do not walk around alone at night! Great location, facilities and lovely staff. The hostel was very quiet so I did not find it particularly sociable but I was there in the low season so this is to be expected. I would definitely stay in this hostel again the next time I am in Bogota. I loved my stay at this small and quiet hostel, and the best thing was the staff. They were so sweet and helpful! The Venezuelan receptionist even cooked her local delicacies for me. Thank you dearly!! It's not a party hostel, only few guests, but perfect to relax. It's essential, clean and very close to all main attractions or bars/restaurants in la Candelaria. 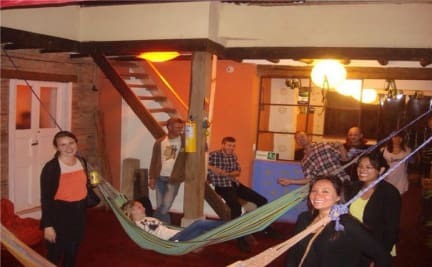 Stayed at Bakano twice in one trip Great hostel, very relaxed and family vibe They made me feel very welcome on my first visit to Colombia and helped me sort activities, trips and taxis Location perfect in the heart of the co La Candelaria barrio Gracias amigos, Hasta pronto! I stayed at the Bakano for 3 nights. The staff are very friendly and you can sit and talk with them. The hostel is not a very social hostel which was good for me as it was quiet but might not be for everyone. I’d say it would suit the over 25s best. The hostel is on the edge of the Candelaria and is about a 10-15 minute walk to mist of the main sights. It is close to Las Aguas transmilennio for those who understand that system. Do not go if looking for party atmosphere. Staff does not speak english. Breakfast very basic. That being said, clean hostel, nice staff and very quiet. Well located and safe. Nothing great but good value for money, we had the private room with private bathroom for like 45000 COP a night. Solid place to stay in Bogota. Located in a good spot, staff are very helpful and informative, basic Spanish essential. Computers to use, hammocks to chill. Definitely a more relaxed hostel. Breakfast very basic, go out and eat at one of the many restaurants.